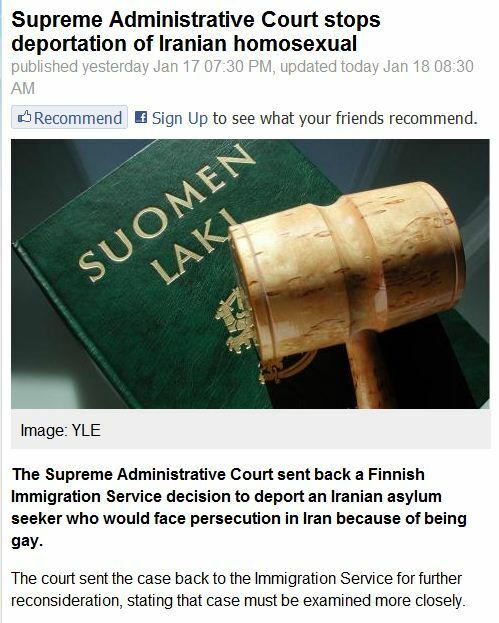 FINNISH SUPREME COURT RESCINDS DEPORTATION OF GAY IRANIAN DUE TO THREAT OF PERSECUTION……. – The Tundra Tabloids……. FINNISH SUPREME COURT RESCINDS DEPORTATION OF GAY IRANIAN DUE TO THREAT OF PERSECUTION……. Previous Post Previous Post FUNDAMENTALIST MUSLIM SHUTS DOWN MEETING OF ANTI-SHARIA ACTIVISTS, THREATENS THEM WITH DEATH……..
Next Post Next Post EGYPTIAN COPTS UPSET OVER ANTI-DEFAMATION LAW, IT PROTECTS ONLY ISLAM……. And if he’d been a Christian… ?